This recipe took about 15 minutes to make and is a great option for meatless Monday or any day you are looking for a filling meal that doesn’t include any meat. Portobello mushrooms have a dense, meaty texture and are mild tasting so they pair well with lots of other vegetables. 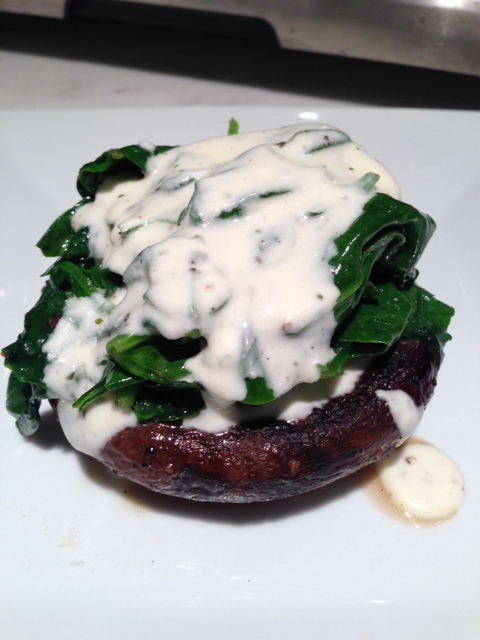 I stuffed the portobello with sauteed spinach but you can really use any vegetable you have at home. I think some grated zucchini, yellow squash, or even blistered grape tomatoes would be nice stuffing options. This can be served as a main dish with a side of brown rice or quinoa or as a side if you choose to serve it with a protein, such as chicken breast. The portobellos take the most time to cook so start those first. In a pan put a dash of evoo and heat to medium heat. Add the portobello mushrooms with the gills down on the pan. Add a splash of water and cover. Cook for about 5 minutes and turn over the mushrooms. If the water has dried up, add a bit more. Season with salt and pepper. While the mushrooms are cooking, take about half the package of goat cheese and put it in a small pan over medium heat. Add the milk and whisk to combine until smooth. If you want a strong goat cheese taste, feel free to add more goat cheese. Let that cook for about 5 minutes. Whisk every minute or so. In a large saute pan, heat some evoo over medium heat and add the spinach. Season with salt and pepper. Using a pair of tongs, mix the spinach and keep it moving until it is wilted. This happens in about 1-2 minutes. At this point your mushrooms should be done. Place the mushroom cap side on the plate, fill with the wilted spinach, and spoon the goat cheese sauce over the spinach immediately. If the sauce sits too long it will congeal and become thick. Looks amazing how the goat cheese just spills over….we have Krogers here in Nashville and usually portebello mushrooms go on sale on Tuesdays…will have to keep this recipe in mind! Yeah! Try it out! It’s so easy!